A select group tried out some new songs and recitations around the fire in Dodds. Very enjoyable. More anon, when this writer gets the time! Arise my darling, and come away. My true love's praises I could never write. Mudcat: What's a killy boyne? You’ll have to check out Mudcat Café yourself to find out what the theories and opinions were. Frank also sang a local song composed 60 years ago, telling about a dispute between two neighbours over a goat. James Dillon was minister at the time; Clement Attlee was Prime Minister in England. Jim Dillon, you did it, you scoundrel... You won’t find that one on Mudcat. She also sang her own song about the emigration of her uncle who had no future labouring for McDermottroe in Roscommon at the time. She made a great job of Banks of the Lee and Staunton’s Brae too. George’s new song: I dropped in to the barbers shop, badly needing a shave... and had him swapping hats with a “toff”, then drinks and finally wives – Exchange is no robbery, so I don’t care. Recitations on the night included Yeats’ Wild Swans at Coole from Martin and Frances’s Nancy Lee and the flea. Martin: Some are fast, more are slow: his own poem, inspired by Céilithe and the set dance gang. Frances was “battered and scarred” and George was too, according to The sick note, written by Pat Cooksey in 1969. Its original title was Paddy and the Barrel, which he tells us (on Mudcat, of course) was based on Gerard Hoffnung's address to the Oxford Union, and this in turn had its origin in a more simple story dating back to the English music halls in the 1920s. And I landed on those building bricks that were scattered all around. Safe home now. See you for the Christmas session. 16 October 2010 - Sing early, sing often! Autumn resolution for the Boyle Singers - we'll be starting at the earlier time of 9.00 (no, really we will), with a view to kicking off the singing at 9.30pm, from next month onwards. This week we had a visit from a Japanese girl from Tokyo, Sayaka, who's doing a thesis on sean nós singing and seems to be visiting all the singing circles and festivals in Ireland, (it's a hard oul' station), gathering information and talking to people. She's a lovely singer herself, too. Jim Bainbridge, Brian and Eileen were welcomed back and were in good voice, as was Eugene – doing a mighty job in his debut as Fear a' Tí. We’re making a small change to our usual format, and the convention is now, a round or two of songs, the sambos and then a free-for-all, or as they say in polite circles: “open to the floor”. Frank and Frances Brennan were noted by their absence – but you can catch Frank at the singing festival in Knockcroghery next weekend, where he’s to appear as a special guest. An aside here: Cnoc an Chrocaire / Knockcroghery was originally called An Creagán (Creggan, stony hill). There was a gallows erected on the hill to hang the Ó Ceallaighs, defeated by Sir Charles Coote in the 17th century. They had resisted Coote’s siege of their stronghold, Galey or Gayley Castle, on the shores of Lough Ree. They were hanged on the hill at Creggan and the deed was remember in the change of name, Cnoc an Chrocaire or hangman’s hill, anglicized to Knockcroghery. Nora had No traitors came from Boyle and Eileen had Siúl a Rúin. Francie did give Jim a lift home anyway. Oh, love of my heart. 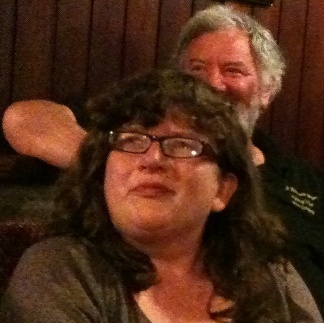 Breege sang of Josie McDermott and of Staunton’s Brae and Brian sang Zozimus’s Finding of Moses. I’ll kick him from the Nile down to the Dodder." And we had Bogies bonnie belle, Isle of Malachy and I wish my love was red red rose from the girl with the new glasses. 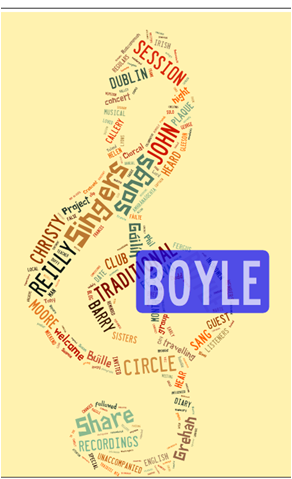 As part of the Discover Boyle day on Sunday 3rd October, the Boyle singers ran an extra singing session, which took place on Sunday afternoon, 4-6pm, in Dodd's Crescent bar. There was an excellent turn-out of the regulars and some new faces too. Several people dropped in, on their way home from the Sligo traditional singers' weekend in Rosses Point, to add their songs to the afternoon. We hope we'll get to see (and hear) them again at our regular sessions, on the 3rd Saturday of the month, every month. For my young banker I will go there. Fleadh Cheoil na hÉireann was taking place in Cavan town this weekend and this meant one of our number arrived a little late and another left a little early as various members of the singers' group travelled over to take part. Hughie was prompted to sing about the famous Cavan GAA footballer, John Joe O'Reilly (1919 – 1952) from Killeshandra. Others sang about Cuckoos, Johnny Morrissey and more. Helen sang about a soldier returning from World War I, damaged and not able to cope with the memory of the horrors witnessed. 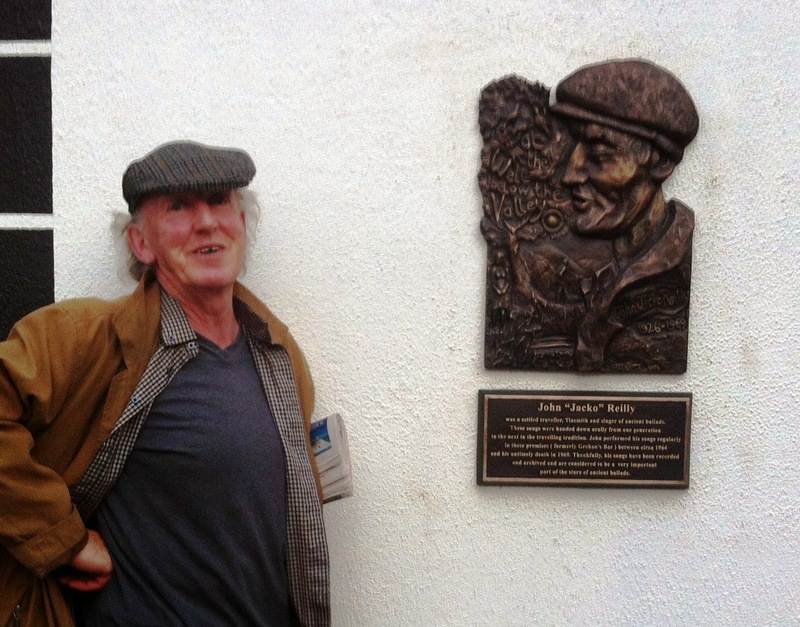 Brian made a grand job of I met Frank Halpin's gander couring Nancy Hogan's goose. Some great songs and rhymes at the Boyle Singers' Circle on June 19th, 2010. There was a smell of sulphur in the air for Frances’ rendition of Peg Kelly's black cat and Martin (from Mayo) brought back holy memories with a recitation about Knock aiport (... money’s expensive shtuff, and we don’t have enuff, to sink in a bog in Mayo...). Derval sang The Raggle Taggle Gypsy ...one sang high and the other sang low... and that was Seosamh maybe, with a wonderful, gentle version of Raglan Road. Disasters of the Great War and other effin wars too, were in both Robert’s and Eugene’s songs. Robert sang a song which came to him from America about the firemen in the Twin Towers and another song about Francis Ledwidge, the Blackbird of Slane. Ledwidge, a soldier with the Royal Inniskillen Fusiliers, wrote Lament for Thomas MacDonagh (He shall not hear the bittern cry ...) and was himself killed in July 1917, near Ypres in Belgium, in a shell explosion. So she washed and scrubbed and scrapped along on seven and six a week. Do liostáil Clíona le sáirsint, ag nascadh téamaí , cogadh agus Co. Mhaigh Eo, in ómós do mhuintir Mhaigh Eo a bhí i láthair. Staying with Francis Ledwidge’s generation, and in recognition of Bloomsday during the week, Tony’s song had Joycean connections. Love’s old sweet song is not only the song Molly and Blazes Boylan were to be rehearsing together, on that famous Dublin day in June, but it was also one of the songs James Joyce sang at the Feis Ceoil in 1904, when he won the bronze medal and John McCormack the gold. Clare followed with Yeats’ Stolen Child. There was nifty guitar playing from several of those present, Helen, Willie and a visitor who dropped in after the Tommy Tiernan gig next door. Another of the visitors from the TT show, Michael, delivered the Apprentice song (When I was a young apprentice and less than compos mentis...), a great one that Eugene has also been known to sing, and Lost Little Children which he heard on Tim O’Brien’s The Crossing. As usual, there were lots more, (Frank’s Plains of Waterloo, Breege’s You learned men, who take the pen and her lovely harmonies, Helen’s On Easter Day you passed my way and her great guitar work, to name but a few) too numerous etc., etc. I wish my love was a red red rose set the night off to a great start. And now I am a mariner that ploughs the angry seas. Seamus Ennis collected On board the Kangaroo from Elizabeth Cronin in Macroom and it's been popular with singers since. The "young maid about 17, I listed in the Navy, all for to serve the King" was inspired by the Kangaroo ship. And maybe also, Waltzing Matilda, sung later on? The Rocks of Bawn, the Boston Burglar, Old Man River, the Bantry Girl's Lament (with lovely harmonies from Breege) and Eastersnow (lovely melody from B.) all got an airing. 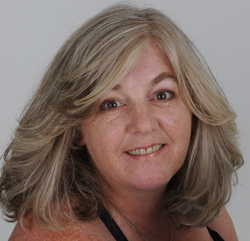 Noreen accompanied herself on guitar and sang Ian Tyson's Four strong winds, (Neil Young was known to sing that one) and Helen sang John O'Dreams. Frances said: Of course you’ve heard of the Nancy Lee and Frank went to the Chapel Gate in Cooraclare. Kilkelly Ireland 2001, composed by Pat Johnson, I believe, and updated to include the sorrowful line: Th’oul volcano’s erupting and I’m in total despair - with feeling, from Joe. Then on to places you don't need to fly to, Raglan Road (Nora), Coolmore (or at least its Maid, by Clare), Carrickfergus (J/G), Shores of Lough Bran (Breege), An Charraig Bhán (nó a bhruach, C). I'm missing more songs and a few more recimitations - for lack of time not lack of quality - ah go on then, John Williams on the Titanic, Kissing in the morning early, An poc ar buile, Gardens in Eden, Bobby McGee, McAlpine's Fusiliers, Johnny Morissey, Dirt (recitation), Getting Dressed (recitation) and Willie McBride. And they didn't stop there, but this writer ran out of beermats for the note-taking. Go dtí go gcastar ar a chéile arís sinn - beirigí bua. Loadsa notes taken - and sung. Get back to you when I find them. Suffice to say, for the moment, that The Men From Keash were back at the bar. 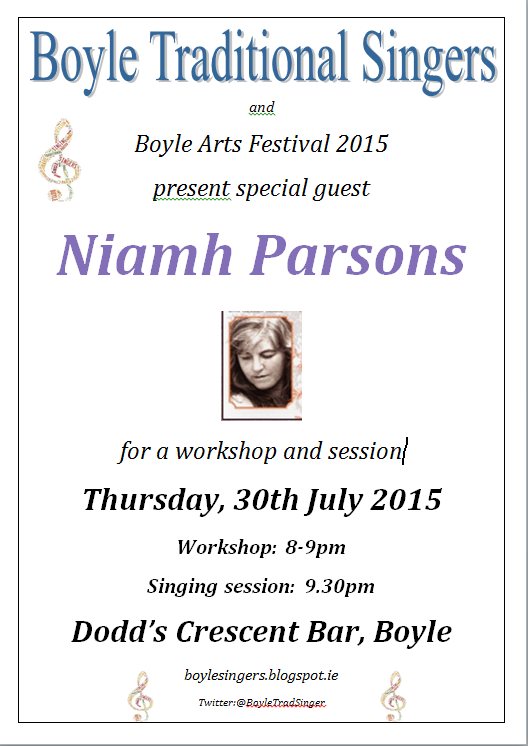 By the way, the Boyle Singers' Circle moved into Dodds Pub in May 2008, so there's an anniversary to celebrate. Good turn out – plenty of songs. Richard Thompson wrote two songs for the other night's entertainment (well, maybe not just for the other night): Beeswing sung by Frank Brennan and Farewell, farewell sung by Clare McGuirk. The Boatman of Lough Key, Jim Flynn was remembered in song by Breege and his brother Tom's composition, My native town of Boyle was sung by Nora. Eileen was in great voice on all her songs, particularly The water is wide. Now what did Eugene sing? Answers on a postcard please. Sean-Nós Cois Life : 16-18 Aibreán 2010.
agus daoine eile nach iad. The spring is definitely here and although the daffodils are a little slow to bloom, St. Patrick's Day was balmy - can you believe that! What happened to the tradition of 'it always rains on (our) parade'? The singers were in fine fettle after the festivities of the week and kept the songs going well on into the night. Some of the gang had headed north to the Inish Owen singing weekend and reports came back that they were having a ball. We hope they have some new songs for us from the gathering and that they'll be word and note-perfect by April. Some regulars missing in action in February but more visitors arrived to make up the numbers for a very enjoyable night in Dodd's. We're getting into the Spring season in style now - come along with old songs and new on March 20th, the 3rd Saturday of the month. Our New Year's resolution is to start at the earlier time of 9.30 - so that we can get all the songs in before the end of the night. Happy St. Patrick's Day and see you right after that in Dodd's Crescent Bar. I love you dear old Erin's Isle my own ancestral home. To the happy pleasant days I spent around Carden's Wild Domain. And join the noble General McSweeney from Killea. And we'll plant our homesteads once again around Carden's Wild Domain. Carden inherited Barnane Castle which had been neglected. The tenants had ceased paying rent and didn't want to start again. As Carden insisted on collecting rents, tenants tried repeatedly to kill him. Carden became known as "Woodcock" Carden, as he dipped and dived like that bird. Once, he overpowered two would-be assassins, marched them to jail and had them hanged. The castle was remodelled to withstand assaults. Carden had a swivel-mounted cannon among his attack-resisting weapons. Then, in his forties, "Woodcock" Carden fell in love with a young girl, Eleanor Arbuthnot, 18 years old at the time and an heiress. He believed that she loved him and that only for her family holding her prisoner, would have declared her love. He pursued her to Scotland, abducted her and was tried and convicted of kidnapping. Many songs were composed about him and the song, "Carden's Wild Domain," was very popular in Ireland. Eleanor Arbuthnot apparently never married. Barnane Castle is now in ruins. Sad to report that that great singer, Kate McGarrigle, passed away on Monday, 18th January 2010, aged 63. Here's an article about her from the Canadian Globe and Mail newspaper. It's time to start planning out trips to the best Singing events coming up in 2010. 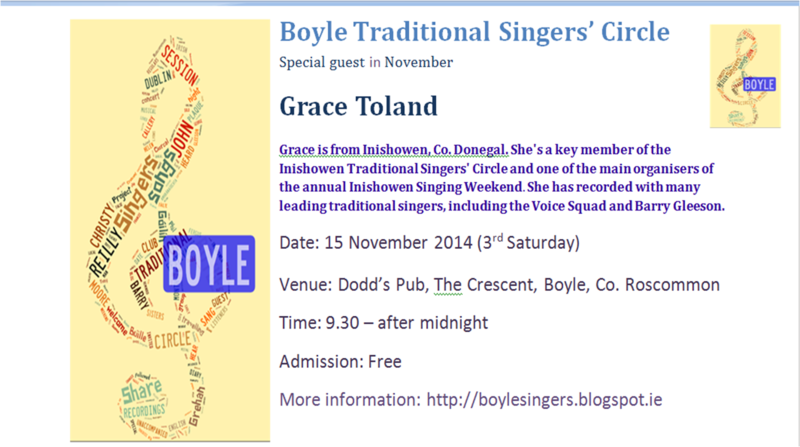 The first one that comes to mind is the Inishowen Traditional Singers' Circle weekend in March. 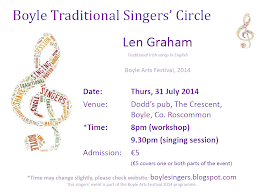 The Inishowen Traditional Singers also hold a monthly session, usually the second Friday of the month. Last month, wind and rain, this month, sleet and snow. Roll on 2010 and the Boyle singing circle. Happy New Year to you all. Come along and sing a song for us in 2010.